Independent Promotions » Get Ready! 2009 was an amazing year for the hugely successful 90’s boys band. They tore the roof of at every party and festival with their 90’s revival. An ultimate mix of all their biggest hits, enough to get any crowd jumping. This success resulted in a remake of one of their biggest hits “Diep”. The media attention was huge. Hit The Road (VTM), Hole In The Wall, Anne TV, Man Bijt Hond, De Rode Loper, … Everyone wanted a piece! 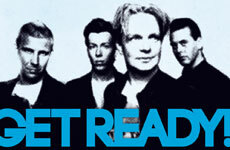 By the end of 2009 their new best off album “Get Ready and Party!” was released. In 2010 they continued to please the fans on as much stages as possible, and the idea to release a new record started to grow. By the beginning of 2011 the wait was over, and they released their first new single in years. “Iemand Zoals Jij” was released at the beginning of January and by mid January they were already in the top 10 of the flemish charts!